Thirteen Metrobus routes are expected to be impacted: 42, 63, 64, 70, 71, 79, 80, D4, G8, P6, S2, S4, and X2 will all be detoured around the closures. The Circulator’s Georgetown-Union Station route will be split into two routes around the closures at the Convention Center while the Convention Center/Waterfront route will go no further north than I Street. Mt. 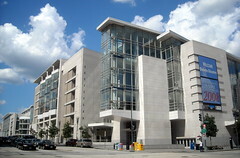 Vernon Sq./Convention Center Metro will close on Sunday night and will not reopen until Wednesday morning. Trains will transit the station, but not stop, and no street access to the station will be permitted. Parking Restrictions will be in effect throughout the area, so don’t expect to park your car on the street anywhere near the Convention Center Monday or Tuesday. In addition, if you work over there, you won’t be able to reach your own garage, most likely. You will have your ID checked entering the zone, which will be available to business owners only. Included in the zone is The Passenger, so expect to find a new place for cocktails for Monday and Tuesday. 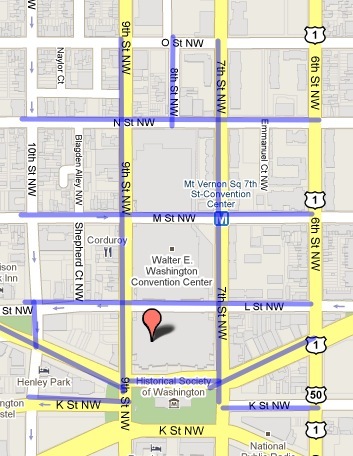 Click through for a map of the closed streets. Will Georgetown to Union station Circulator riders be charged twice?